If you’re reading this, I know something extraordinary about you: You’re alive.That’s a tremendous gift—and it’s also terrifying. The life you’re living right now, the life I’m living? It’s not a dress rehearsal. This is the real deal. We all want to know what truly matters in life and what is going to give us purpose and joy. If we get only one shot at today, how can we best live it? Jesus’ answer is deceptively simple: Love the Lord your God with all your heart, soul, mind, and strength. And love your neighbor as yourself. Embedded in this greatest commandment is movement. A beautiful and intentional adventure that leads to a life beyond anything we can imagine. 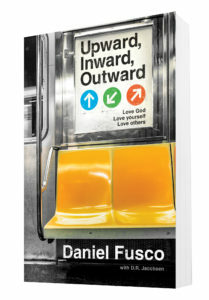 Are you ready to move upward, inward, and outward into the life you were made for? We created a way to deepen our communities and introduce other people to Jesus for the first time – all at the same time. We’re launching a new small group curriculum to accompany Upward, Inward, Outward. All it takes is inviting people into your home. We created DVDs and workbooks that will lead you through a meaningful conversation about Jesus’s Greatest Commandment in a way that people love. Get the Upward, Inward, Outward Small Group Curriculum today!